More than 3,800 of the undergraduates hail from California, with the remaining 430 coming from 36 other states and 20 different countries. (Photos by Carolyn Lagattuta) See more photos from Move-in 2016. The Banana Slugs are back. 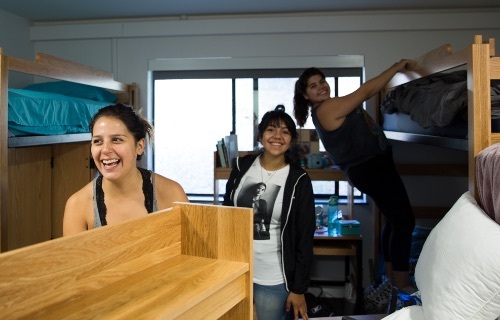 UC Santa Cruz welcomed approximately 4,235 freshmen and 1,125 transfers who begin instruction today. The Division of Graduate Studies estimates that there will be about 700 new students pursuing their Ph.D. or master’s degrees this year. 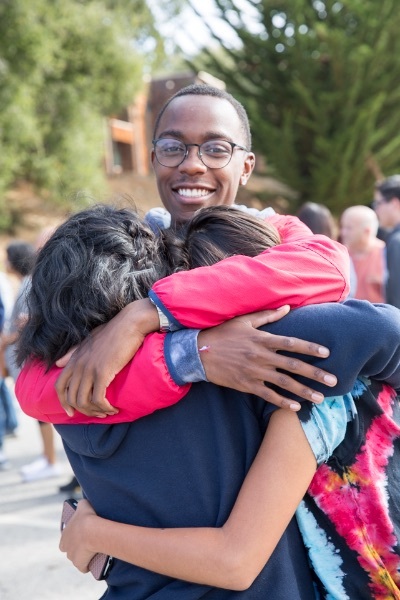 “We couldn’t be happier to see the increases in California residents and our increases in students coming from underrepresented ethnic backgrounds,” said Michael McCawley, director of admissions. The incoming undergraduates show more ethnic diversity from fall 2015. African American/Black students increased by 38% (63 more students), American Indian/Alaskan Native increased by 47.6% (20 more students), and Hispanic students increased by 12.1% (156 more students). The academic profile of the incoming frosh remains very strong with a mean GPA of 3.7 and all test scores (ACT and SAT) showing increases. Approximately one third of the incoming students will be the first in their family to earn a four-year degree. More than 3,800 of the undergraduates hail from California, with the remaining 430 coming from 36 other states and 20 different countries. The campus has also enrolled about 1,075 California transfer students and about 50 nonresident transfers, and plans to welcome 100 to 125 more in winter quarter. Nearly 98% of the transfer students are coming from a California community college. UC Santa Cruz has invested in resources to support the larger class—increasing the capacity of on-campus housing from 9,000 to 9,300 beds, hiring more faculty, lecturers, and staff, and deploying new online tools to help with student advising. The campus is committed to freshmen graduating in 4 years or less, including developing some three-year pathways for certain majors by using summer session enrollment to expedite the time to degree. “We have new programs in place and with existing programs are fully committed to raising the achievement and graduation rates of all our students,” said Interim Vice Provost for the Division of Student Success Jaye Padgett. This academic year, UC Santa Cruz will have more than three dozen new senate faculty members, bringing the campus total up to 577. UC Santa Cruz is a Hispanic Serving Institution member of the Hispanic Association of Colleges and Universities, with 30 percent of undergraduates identifying as Hispanic or Latino. The HSI status helped the campus win two grants—totaling $3.6 million—from the U.S. Department of Education that will help UC Santa Cruz increase achievement for Latinos and all students on campus. UC Santa Cruz is also dedicated to helping students pay for college. In 2014–15, 82 percent of undergraduate students received a $298 million in financial aid or campus employment. Additionally, 92 percent of UC Santa Cruz graduate students received $58 million in aid or employment. Students moved in last week and have been busy learning about the campus through a series of welcome week events.